When it comes to landing pages marketers often have trouble with one part — creating compelling copy that makes visitors convert. Not all of us can write with the prose of a veteran copywriter so it helps to have a simple formula, based on proven results, to follow. If you haven’t heard of it already, the AIDA formula was created to smooth out the copywriting process. The AIDA formula has been around for ages and is still an effective formula used by marketers today. Let’s say you own and operate a budding hot yoga studio that primarily targets women age 25-40. Males and elderly people also participate in your classes but are a secondary audience. The summer is fast approaching and you’d like to fill up all of your classes by attracting new people interested in improving their health. You decide that a promotional offer will drive the most people to come and experience your unique hot yoga practice. You decide to offer a month of unlimited hot yoga classes for $49 in hopes of attracting women who want to give it a try. The promotional discount can also appeal to friends who want to try to get fit together. Your next step is to create some advertisements — using services like Google, Bing, and Facebook Ads — and point them all to your hot yoga studio’s landing page for visitors to claim your offer. Now it’s time to create some compelling copy using the AIDA formula for your landing page so that visitors convert and claim your offer. Attention - Grabbing the reader’s attention to make sure they continue to read-on. Interest - Making sure they’re interested in what you have to offer. Desire - Creating an unquenchable desire to claim your offer. Action - Making your reader accomplish your desired action or outcome. Let’s break the AIDA formula down and see how you can apply it to your own copywriting. Before you try to grab your visitor’s attention it’s always best to start by listing what you know about your target audience. This includes demographics, likes, dislikes, desires, pain points, etc. Since you’re going to be offering a summer-themed promotion for women aged 25-40, we can touch on a bunch of pain points to grab their attention. We’d like to speak to women that may or may not have tried hot yoga and that are keen on making a health change this summer. Keep in mind that the headline is the most important piece of copy on your landing page. Statistics have shown that 80% of people don’t read past the headline if it doesn’t grab their attention. The Summer Body of Your Dreams Awaits. $49 for One Month of Unlimited Hot Yoga. Bring the Energy Back to Your Life. $49 for One Month of Unlimited Hot Yoga. Summer is Here, Let’s Sweat. $49 for One Month of Unlimited Hot Yoga. Your Summer Body is Only A Few Classes Away. $49 for One Month of Unlimited Hot Yoga. Reconnect With Your Mind and Body This Summer. $49 for One Month of Unlimited Hot Yoga. It’s Time To Make a Change. $49 for One Month of Unlimited Hot Yoga. The New You Starts This Summer. $49 for One Month of Unlimited Hot Yoga. Sick and Tired of Feeling Sick and Tired? $49 for One Month of Unlimited Hot Yoga. Combine your copy with an optimized landing page template for maximum conversion! If your visitor has made it past your awesome headline they’ll arrive at the section where you’ll have started building interest. Ask yourself, what about my product would make it interesting to my target audience? Does it solve a problem? Does it offer a solution? Does it have benefits? How can I explain this to my audience? Facts and statistics - "80% of all hot yoga regulars note an increase in positive mental and physical benefits"
A captivating story - "Emily Daveres was tired and fed up with being out of shape until she tried hot yoga for the first time…"
A pain point felt by many - "Wouldn’t it be nice to have a physical activity that is accessible to all fitness levels and is guaranteed to help you get in shape?" The difference between interest and desire can be a little confusing. An easy way to think of it is that desire has intent. Before you can create the desire to buy, you must have created interest. Once interest is created it will mature into desire. In other words, desire is the stronger, more developed version of interest. How can you create desire? Again, by knowing who your target audience is you’ll be able to pinpoint their pain points, urges, likes, and desires. In the case of our hot yoga offer, their desire is to experience a new form of body altering exercise. By targeting their desire to feel better and look better we can position our offer to fulfill that need. The best way to do so it to use words — depending on your desired outcome — that are linked with emotion. What emotion do you want them to feel to influence their action? In the case of our hot yoga studio, we would like them to feel inspired enough to buy our offer. 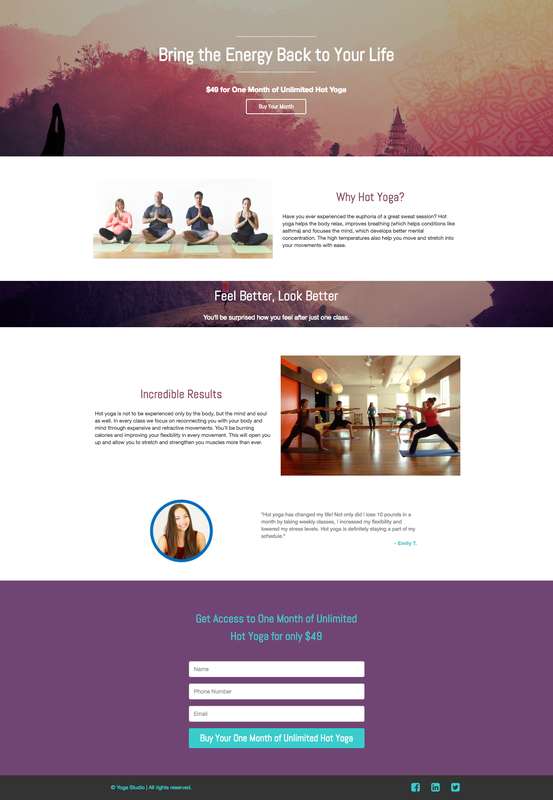 In the hot yoga landing page example above, I decided to touch on the benefits of hot yoga coupled with a positive review of the hot yoga experience. I wanted to create a sense of impending accomplishment and satisfaction for the visitor so that they would be able to picture themselves using hot yoga to benefit their life. This is the part when your copywriting efforts culminate into one action. This action is the outcome you’ve been aiming for throughout the whole landing page. The action, also known as your call to action, should drive your visitor to act. In the case of the hot yoga studio, we would like the visitor to enter in their information and buy a month package. Notice how the buttons on the top and the bottom of the landing page example above say exactly what is going to happen? Once a visitor clicks one of those buttons they will begin the process of buying their one month package. By using exact, action-oriented language, you leave out any guesswork or doubts for the visitor. Aside from the headline, your call to action should be your focus. Be sure to guess and test your call to action to see what’s working for your visitors. Eliminate or add things to your copy that are preventing users from converting on your offer. Are your visitors reading to the bottom but not clicking the button? Maybe your language is not exciting enough. Maybe you failed to give them enough desiring benefits. There you have it guys, the AIDA formula. Simple but effective. Next time you’re having trouble thinking of compelling copy for your marketing materials remember the AIDA formula. Start by capturing their attention, build up their interest in your product, create a desire for it, and make them act. No copy is perfect the first time around so it’s always important that you test. There will always be room for improvement. As you get to test your writing you’ll get a better sense of what is resonating with your audience. If this has helped you with your copywriting please give it a share on social media! Have you had success using the AIDA formula? Or do you use something else? Share your thoughts below!